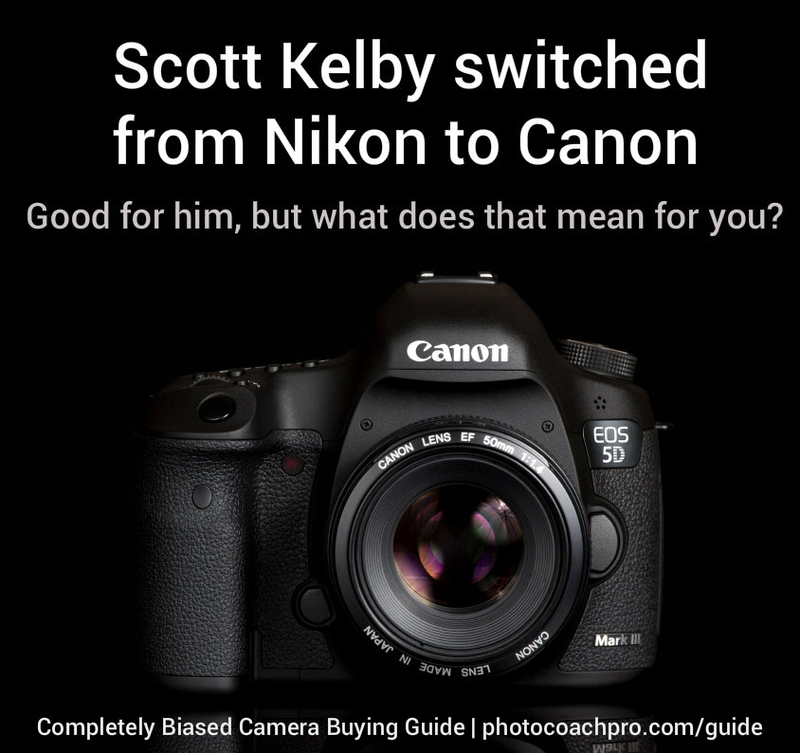 Scott kelby switched from Nikon to Canon. Should you? What should I do with that info? That’s what really annoys me. Someone might actually consider switching brands based on Scott’s decision. Who is Scott Kelby anyway? Scott Kelby reached celebrity status as the author of almost 50 books on photography and Photoshop. He is the editor of Photoshop User magazine and co-founder of the National Association of Photoshop Professionals. He leads the Photoshop World conference and also pioneered the World Wide Photo Walk. The man has is own Wikipedia entry. He’s a big deal. As you might expect, an endorsement from someone at his level carries some weight. So when Scott Kelby, who is also known as a Nikon shooter, suddenly shows up toting a Canon DSLR, people notice and inquire. That’s why Scott Kelby says he made the video. I don’t. It’s mildly interesting to me. I take the same interest as knowing Michael Jordan wears Nike shoes. I don’t expect that donning Air Jordans will help me run faster or win a dunk contest. Jordan would still be Jordan in Reeboks. Likewise, it doesn’t matter what camera Scott Kelby uses. He has a level of talent and skill that will produce incredible photos. Then what should I do with that information? What action should I take knowing that Scott Kelby changed brands? That depends. Are you considering whether to purchase a Canon or Nikon for the first time or are you already established on one of the brands? Scott’s paid endorsement is a data point. He says that he likes the way the Canon 1DX represented skin tones and raves about the auto focus speed. If any of that kind of photography is important to you, I’d take note. I’d also make note that Scott’s epiphany came after Canon offered a sponsorship. If Canon called me up and offered to send me a 1DX and 5D Mark III, I would be evangelizing for them by sundown. Just saying. Kudos to Canon for snagging such a high-profile endorsement. What will it mean for the industry? It continues the conversation that Canon is the camera you need if you are serious about sports photography or high-end portrait work. There must be a reason the sideline of all those NFL games seem to uniformly feature the signature Canon white lenses, right? I’m sure Scott’s endorsement will add to Canon’s aura of market dominance, but pros who have been shooting on Nikon’s their entire careers won’t give two flying flips. They won’t be changing. If you are considering which brand to buy, a Kelby endorsement could be a persuasive argument for aspiring sports photographers. Is Canon offering you a sponsorship deal and paying you to switch? No? Then keep what you have and go work on your craft. Take your Nikon/Sony/Leica/ whatever and put in the the work. That’s a more efficient path to Scott Kelby quality photos. The folly of switching is that Nikon and Canon leapfrog each other with features and technology. If Canon has the best performer this year, you can believe the Nikon has a Canon buster that it will unveil within six months. Canon will introduce their Nikon killer in the next six months..and so on...and so on. Competition between these two will continue to produce great cameras for photographers, no matter which brand you select. From entry level to professional, the technology to create great images exists in any new camera you select today. Camera layout, build, and other features become more important when you decide your photography niche. Before you buy in, you should rent both and see which feels best to you. Decide which one is best suited for the type of photography you intend to create. Once you have the best answer for you, it won’t matter what camera Scott or anyone else chooses.